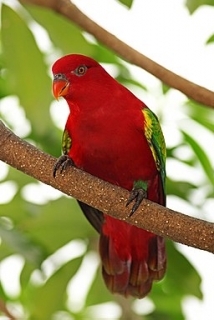 The Chattering Lory (Lorius garrulus) has been trapped to near extinction on a number of islands in Indonesia. In 2016-2017 WPT supported the confiscation and rehabilitation of over 50 Chattering Lories seized in a number of shipments. Where possible the birds were moved to Tasikoki Rescue Centre for treatment and preparation for release back into the wild. In July 2018 the Forestry department of North Moluccas, a WPT partner, released 14 rehabilitated Chattering Lories on Bacan Island in that region. Focus of future work: The WPT is continuing to work with in-country partners, government officials and NGOs, to help protect Chattering Lories from illegal trade. Where found: L.g. garrulus: Halmahera and Widi Islands, N Moluccas, Indonesia. L.g. flavopalliatus: Bacan and Obi, N Moluccas. L.g. morotaianus: Morotai and Rau, N Moluccas. History: The Chattering Lory (Lorius garrulus) is endemic to North Maluku, Indonesia, on Morotai, Rau, Halmahera, Widi, Ternate, Bacan and Obi islands. Six thousand lories are trapped annually on Obi island (North Maluku province) alone (Cottee-Jones et al 2014). A decline of 30-50% over three generations is estimated to have taken place, given estimated population numbers of up to 149 birds per square kilometre. A survey of households on Obi conducted in 2012 found that 27% (54 of 204) kept parrots as pets, the most popular being the Chattering Lory (Cottee-Jones et al, 2014). Threats: The main issue threatening these parrots is trapping for the wild bird trade; they are the most popular cage bird exported from eastern Indonesia. Harvesting of large (nest) trees has become more intensive in the twenty-first century. The subspecies flavopalliatus is in severe decline. Six thousand lories are trapped annually on Obi island (North Maluku province) alone (Cottee-Jones et al 2014). Ecology: These parrots are found in upland forested areas up to 1300m (4264 ft). They are most commonly reported in pairs in primary and mature secondary forests away from settlements, and feed on pollen, fruits, nectar and flowers. They are noisy and conspicuous in flight but difficult to spot while feeding in forest canopy.